Not sure about your ministry but we often find that there is a need to prepare a meal for a large group. I like to cook. Therefore, panic doesn’t set in when I need to throw together a meal for ten, fifteen or twenty people. I have lots of recipes that lend themselves to larger gatherings. As Mexican tacos, burritos, and salads have become more popular, they have replaced Italian as my favorite throw together meals. When making tacos, I use flour tortillas, rather than corn. Hamburger or another meat can be sauteed quickly in a frying plan. Ranch Style beans (a brand name) are great as a side dish or to put on your taco. A mixture of condiments can be thrown into separate bowls in minutes and people are heading through the buffet line in less than an hour. If you cannot break from Italian, be sure to find a packaged sauce that you can live with and use that with your favorite meat and pasta. One of favorite easy meals has become the three pasta meal. I usually prepare spaghetti with a marina sauce, fettuccine pasta with an Alfredo or white sauce. And a cold pasta salad, using almost any larger pasta. I love to use shells because they are so pretty. 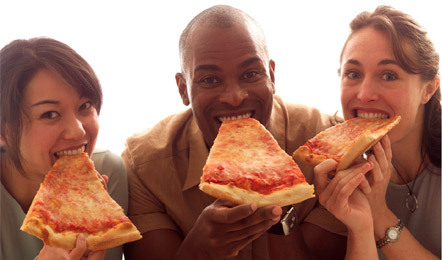 If you aren’t up to cooking, pizza from Domino’s is a mainstay. Add a salad made from the packaged mixed spring leaves with lettace and tomato and you have a healthy meal. 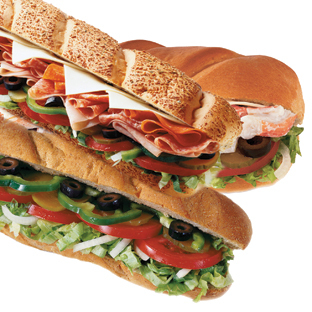 However, perhaps the best and most economical meal currently is the 12 inch Subway sandwich for $5. We ask the store to put most of the condiments on the side and allow us to add mayonnaise or mustard. If you cut the sandwich in to four pieces instead of two, you will find that the meal with stretch farther than you can imagine. Recently, when we had to serve 33 large adults, we ordered 33 $5 subs. We asked that they put the condiments on the side, including the mustard and mayonnaise. We had potato and corn chips, soft drinks and cookies for dessert. While this wasn’t our plan, there was enough food for two meals, lunch and supper, with three subs left over. The cost of each meal was about $3.50 person, including drink. I almost felt as though the Lord was multiplying the food. Within your ministry, there will be times that you should be prepared to feed a large group of people. It is wise to have a meal plan stuck somewhere in your back pocket. · Share firsthand job experiences with those interested in your career field. · Gain access to a pool of new emerging talent. · Recruit short and long-term interns. · Demonstrate positive leadership in their community. the first state to have 100% participation across all counties statewide! Get Involved in DMD! Be a Mentor! there is an opportunity for you. typical day on the job and how to prepare for that particular career. learn first hand about different types of jobs and related opportunities within that career field. Individuals on the back of this flyer OR download forms at http://DisabilityBrevard.org. Introduction–Can we follow signs when they are all wrong. Remember after the hurricanes when the street signs were all twisted in Vero. Many were gone–almost all are turned the wrong way. These signs say the right things but you can’t see them because they are down on the ground or they are turned the wrong way. Sometimes our lives get twisted and we become people who don’t do what God wants. A. The Apostle Paul wrote about faith and grace. He said they are God’s free gift. There is true. A. How many Sundays I hear the sermon–because I give it–and I think this is good but I don’t do what God’s word teaches me. 1. We hear, God is love–so we must love the people you meet each day. 2. We leave the church service and fight over a piece of cake or a chair. 3. God says feed the poor–Therefore, we should help to get food to people who need it. Remember when Karen gave money to Brevard Special Gathering to help with expenses of evacuating during the hurricane. Conclusion–James said, “we are to do the things we hear. We are not to merely listen. We are to be ACTION people. Living for Jesus is not a part-time job. God, the Father, gave us His Spirit to enable us to be like His Son. A true Christian will draw others to the light. Give Christ the key to every room in your life.